It seems now that my blogsite is 80% complete with codings, features, and the template design which fits to pinoy blog design hosted by blogger or blogspot domain. I just made this pinoy blog on month april 2011, fresh and thin blog form the start and until now, but i tried to make some improvements on it - from the title, subtitle, block form, blog title, blog despcription, blog code, features, and many others to mention. I gave some time, extra time, and enough time for making this one, and it gives me happiness and worthiness to be as one of pinoy bloggers out there in the world wide web. The willingness, eagerness, determination, drive, patience, and some virtue i applied for having this blog and why i come up to pinoy blog. Also inspired by pinoy bloggers who are willing to contribute and serve pinoy and other people through blogging. I'm not saying that my blog comes up an elegant and high quality blog, at least i have come up and improve my blog regardless of difficulties in improving my pinoy blog and i think more about continuing my pinoy blog giving me the opportunity to impart what i want to - the freedom to take part. So if you have to make your own blog - then its not impossible as long as you have the willingness and persistence to make a blog and as long as you love to blog because i started to love blogging now. And its not a hindrance of having difficulty in English grammar usage, coding task, searching for source, time managing, and others to mention for i myself take that part. Truly, I have a bit difficult in english grammar usage, source coding, template designing, etc, but it does not stop me from having my pinoy blog because i believe every person will learn and learning never stops - spare me about it. Go back to the topic, my pinoy blog slowly improve and its traffic also improves and that's gain for improvement. One of those things i made is searching for SEO(search engine optimization) topic, I read it and apply some of those codings, thanks to bloggers who published about SEO. 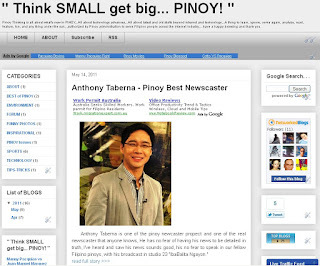 Other things is, I change the blog title from "Start small Get BIG...PINOY!" to "Pinoy Thinks BEST" which i realized that the title is one of the important factor for your blog, thinking that the present blog title is more effective, concise, and specific - that's why i've changed the title. Then the blog description - " Pinoy Thinks Best is all about the best of Pinoy, promoting pinoy at best, in blogging, in technology updates, in latest news, in sports, in internet, in entertainment, in the world wide web, in life, and in general. Latest and old stuffs beyond internet and technology. Thing to learn, ignore, come again, analyze, read, feature, fun, and any thing under the sun, authorized by Pinoy administration to serve people across the internet industry. " Many to mention about how i made this blog, and if you're interested of making your own blog, you can do some research to search engine like google, yahoo, bing, or any other search engine you have, with some keywords like "how to make a blogsite", "how to blog on blogger", "blog instruction on blogger", "pinoy blog instruction", "step by step procedure for blogging", or any of that words combination you will going to input in the search engine and i am sure search engine will give you more related results and directs you to where you want to have. The images below are the screenshot of my pinoy blog i made from before and present webpage template. If you find this helpful, you can come back to pinoy blog through http://pinoy-thinking.blogspot.com.Thank you.